HADDONFIELD, Illinois -- John Carpenter, via his record label, Sacred Bones Records, has officially announced his score soundtrack to the upcoming sequel to his 40-year-old slasher classic, Halloween. The album will drop October 19, 2018 -- the same day as David Gordon Green's film. Sacred Bones uploaded a 30-second preview of the score on its official YouTube channel. It features a dark, foreboding synth with heavy bass, in the key of D minor. 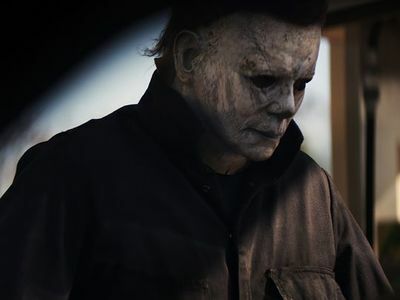 Toward the end, as the British documentary filmmaker taunts Michael with "I have something you might like to see..." We hear what appears to be a slowed-down version of the Halloween theme. The Master of Horror will also be touring in October, with a special Halloween (the October 31 holiday, not the Michael Myers film franchise) gig in LA at the Palladium. And did anyone mention that Halloween (the 2018 film) will premiere at the Toronto International Film Festival in September? Again, the film and soundtrack arrive October 19, 2018. This page was last edited on 19 February 2019, at 13:14.